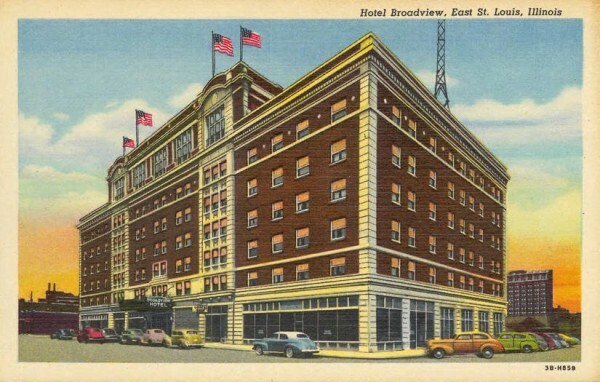 Postcard view of the Broadview Hotel. Source: Theising Collection, University Archive, Southern Illinois University Edwardsville. The Broadview Hotel was the city’s largest and finest hotel, and fulfilled its developers’ vision of building a hotel that would be a regional and statewide convention and meeting venue. Broadview also is an excellent example of hotel design and construction in the St. Louis region in the 1920s. Designed under the direction of Arthur J. Widmer for Widmer Engineering Company, the Broadview embodies the principles of Classical Revival design as well as modern urban hotel planning. East St. Louis would build no larger or finer hotel. During its heyday, the Broadview Hotel helped solidify the status of East St. Louis as an emerging large city and as Illinois’s largest downstate city. Political corruption and racial tensions grew in East St. Louis into the 1910s. The city’s image would be gravely damaged by a tragic racial riot on July 2, 1917. Leading up the riot was a wave of migration of African-Americans from the South who arrived at the start of the Great Migration. At the same time, more Eastern European immigration was underway. Industrialists capitalized on this more affordable labor and offered jobs at factories around East St. Louis, breeding resentment among white residents. The race riot was the climax of long tension, and it claimed at least 47 lives, as many as 312 buildings and 44 rail cars. Civic leaders did not stop at pressing for political and cultural change, but pushed for architectural modernization as well. The riot was a reminder that East St. Louis was not a unified urban place like its neighbor across the river. The War Department’s investigation into the race riot led to the establishment of the oddly-named War Civics Committee, changed with crafting a program to address racial tensions. The agenda strongly recommended adopting a new city plan for physical modernization and guided growth.The Broadview Hotel would fit well into the city’s attempts to modernize and unify its civic and cultural life following the 1917 race riot. The Broadview as it appeared in 2013. In 1926, the Broadview developers purchased a site between Fourth and Fifth streets on the north side of Broadway in the heart of downtown. At that point, East St. Louis lacked a modern, large hotel capable of hosting conventions. The leading hotel in East St. Louis long was the National Hotel at the Stockyards, but it was remote from downtown and catered to the livestock trade. Downtown’s largest hotel was the Ill-Mo Hotel, but it burned in 1927, creating a fortunate coincidence for the Broadview investors. 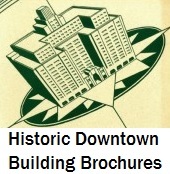 The Broadview Hotel’s developers sought to establish the hotel as a center of civic life, with ample facilities for fraternal, civic and labor organizations to host meetings, space for the public to dine, and suites on par with those found in St. Louis and large cities across Illinois. And even before the hotel opened, the hotel’s reputation was paying off. The Broadview Hotel also offered East St. Louis its first and only professional radio studio. On November 1, 1927, the studio opened as home of radio station WIL. In 1935, a new station took over the studio in the hotel. A large tower was built atop the hotel for transmission of the radio signal. WTMV attracted listeners through play-by-play announcements of the games of the St. Louis Cardinals and a strong program of music. In 1940, the station was sold to general manager William West and Chicago advertising executive Carlin French. The station became well-known as a “training school” for broadcasters who moved on to larger markets. While it was a striking fulfillment of East St. Louis’ ambitions, the hotel opened on the onset of the 1929 stock market crash. The original syndicate failed to maintain control of the hotel, and it was sold at auction in August 1931. Financial troubles plagued the hotel as its stockholders failed to retire debts. 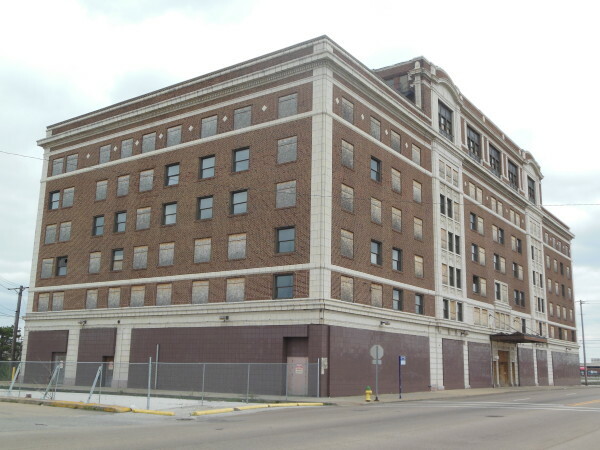 In 1935, the Broadview again went to auction after the United Bank & Trust Company of St. Louis failed to retire a $39,500 loan for which it put up the Broadview as collateral. The United Bank & Trust Company was a major Broadview stockholder. Eventually, the Broadview landed semi-permanent residents who occupied rooms as apartments. In 1946, celebrated former Philadelphia Phillies pitcher Grover Cleveland Alexander was residing at the hotel while the St. Louis Cardinals won the National League Championship across the river. Alexander lived at the hotel up until his death in 1950. East St. Louis’ notorious businessman Frank “Buster” Wortman also maintained a suite at the hotel for meetings through the 1950s. In 1957, Southern Illinois University opened extension campuses in East St. Louis and Alton. The university leased the second floor of the Broadview Hotel for office and residence space. The hotel’s name soon after changed to the “Stadium Hotel,” and its glory days were over. In 1971, Southern Illinois University executed a 15-year lease with option to purchase the Broadview. The university closed on purchase of the hotel building in 1978 and undertook a $1.5 million renovation in 1988. During that renovation, the university removed and replaced the hotel’s windows, altered floor plans on the upper floors and enclosed the storefront openings at the building’s base. The university occupied the Broadview Hotel until 2004, since which time the building has sat vacant. The National Park Service highlights one nomination per week, and the Broadview Hotel nomination, written by PRO Director Michael R. Allen, received the distinction at listing.